All class-specific events are highlighted like this example for easier identification. Use the web browsers Firefox or Chrome for best viewing. Click on a date to view its schedule. For those who arrive early we have reserved space at the Eric Carle Museum of Picture Book Art and the Yiddish Book Center. Come together for dinner and socializing with fellow classmates. Come together for dinner and socializing with fellow classmates. Cost: Individual checks at dinner. Join classmates in the dorm for a free continental breakfast. Demonstration with tea masters from Urasenke Boston. Due to limited space, reservations are required. Sign up at reunion check-in, Mary E. Woolley Hall, New York Room. Admission at either 2:00 p.m. or 3:30 p.m. Tours last approximately 75 minutes and no reservation is necessary to participate. Attending Reunion with a family member in grades nine to eleven? The Office of Admission will also host a drop-in hour 2:30–3:30 p.m. for questions about the MHC admission process or the college admission process in general. A member of the admission staff as well as current MHC students will be available to answer questions. Sycamores, the 1788 home of Colonel Ruggles Woodbridge, was a dormitory from 1915 to 1972, home to 800 MHC sophomores. Located at 28 Woodbridge Street, about 300 yards north of the Village Commons, Sycamores is being renovated by the local historical society to reflect the life and times of those who have lived there during the last 225 years. You will see the silk embroidery made by Sophie Morgan at the Abby Wright School here in South Hadley in 1805, the newly decorated period rooms and the attached Rawson House, the 1733 home of South Hadley’s first minister as well as the home of Joseph Brodsky (1940–1996), MHC professor and Nobel Laureate. The third floor of Sycamores is being made into a unique museum of typical MHC dormitory rooms when students lived here. It will feature an amazing group of gifts from Carolyn Chesebrough Foster ’58. Starting at 5:00 p.m. enjoy outdoor activities, including badminton, croquet, horseshoes, bocce ball, and corn hole. In the event of rain enjoy indoor group games of charades, Pictionary, and many more. Demonstration with tea masters from Urasenke Boston. Due to limited space, reservations are required. Sign up at reunion check-in, Mary E. Woolley Hall, New York Room. is a practice that nurtures the spirit and strengthens the body and mind. This event will begin with a short presentation about the museum’s current programs and initiatives, followed by a tour of the galleries. reunion attendees from all classes who may live just down the street or across the globe. A digital slide show displaying a broad spectrum of creative efforts by classmates, including fine arts, theatre, crafts, gardens, and other categories. Ongoing through 5:00 p.m. Saturday. For alumnae, seniors, and guests. Meet for a tour of the Mount Holyoke College Art Museum galleries, followed by a social at Willits-Hallowell in the Faculty Club Room. Enjoy cocktails and finger foods with classmates. For Cornerstone and Mary Lyon Society members and guests. Join your classmates for a discussion led by Judith Osborne on the Common Read, Between the World and Me by Ta-Nehisi Coates. Join your classmates for a movie, and decorate parade signs for the parade on Saturday. Join your friends for hanging out, reconnecting, and having fun! There will be a movie, music, conversation, and snacks. Join classmates for a panel discussion moderated by Carolyn Sullivan. Willits-Hallowell Center check-in closes at 8:00 p.m. for the classes of 1942 and 1952. Get ready to have fun and row! Alumnae, rowing friends, partners, and children all welcome. You will be finished in time for parade lineup. Contact Heather Putnam at hputnam@mtholyoke.edu or 413-538-2851 with questions. Join classmates in the dorm for free coffee. Join us in the garden to renew our spirit and prepare our body and mind for a new day. The session is led by certified instructor Hong Vuong ’95. Plants from the gardens and greenhouse are available with proceeds to benefit the Botanic Garden. Please begin lining up no later than 10:00 a.m., and don’t forget your white clothes! The Alumnae Meeting will be in Chapin Auditorium, Mary E. Woolley Hall. 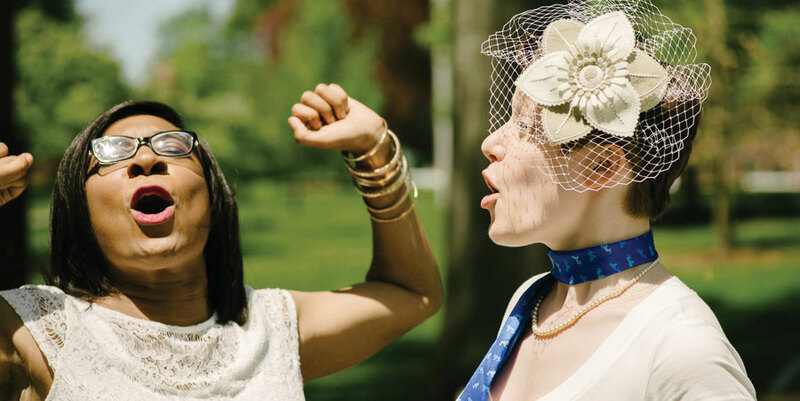 In celebration of 145 years of tradition and success, Mount Holyoke College alumnae and guests gather to honor the past and welcome the future. The museum features more than 7,000 objects representing a lifetime of collecting by local industrialist and philanthropist Joseph Allen Skinner (1867–1946). This fascinating early 20th-century cabinet of curiosities boasts objects from around the world and across time. After moving an 1840s meeting house from the Quabbin town of Prescott to South Hadley, Skinner opened his collection to the public in 1932. It became part of the Mount Holyoke College campus in 1946 and is administered today by the Mount Holyoke College Art Museum. This one-of-a-kind collection is preserved as an educational resource for the campus and the community, as Skinner intended. A visit to the Skinner Museum is always a memorable occasion! Enjoy lunch on Saturday in one of our lunch centers or bring it out on the Mary Woolley Green to enjoy the festivities. Stop by to play outdoor games, make class buttons with Archives, get a MHC tattoo or a photo with PAWS, and put yourself on the cover of the Alumnae Quarterly to celebrate the 100th anniversary of the magazine. There will also be MHC alumnae selling class products, and our very own WMHC DJs playing music. Enjoy your afternoon on the Green. Uncommon woman of a certain age: What are you keeping, what are you taking up, and what are you letting go? An opportunity to speak and reflect together on matters small and grand. Moderated by Laura Rogers. Tour will begin in the atrium of the library and will finish within the hour. Join us for a behind-the-scenes look at special exhibitions and the Teaching with Art program. Sign up at reunion check-in, Mary E. Woolley Hall, New York Room. Join classmates for a discussion around the class read, Hateship, Friendship, Courtship, Loveship, Marriage: Stories by Alice Munro, led by Nancy Lee. Visit the museum to see current special exhibitions and the diverse permanent collection. Enjoy refreshments and conversation with museum staff. For LGBTQ alumnae and guests. Take a tour with Talcott Greenhouse staff from 3:00–3:30 p.m. and stay for an informal reception with light refreshments. For assistance after 4:00 p.m. please see the receptionist in the Alumnae Association office. Willits-Hallowell Center check-in closes at 5:00 p.m. for the classes of 1942 and 1952. Meet for a tour of the art museum galleries. A tribute to Founder’s Day (ice cream served). We will be joined by Sonya Stephens, acting president of the College. Dinner with Sonya Stephens, Acting President of the College. Come together for dinner and socializing with our fellow classmates. Songfest with Jack Craig, pianist, featuring music we remember from our college days. Enjoy refreshments and the museum’s beautiful galleries. A lively gallery tour will be offered at 8:30 p.m.
All classes are invited to Reunion’s ultimate dance party! Dancing through the Decades celebrates the music that brought us through Mount Holyoke. We’ll dance the night away to hits from the ’50s all the way through the anthems of 2012, hitting our favorites from the ’60s, ’70s, ’80s, ’90s, and 2000s along the way. Cohosted by the classes of 1972, 1982, 1987, and 2012. Attendance is free, but donations are encouraged! Come join us! Reverend Kathryn J. Campbell, convener. Join the religious and spiritual life chaplains and advisors for an uplifting service celebrating the richness of our diverse religious and spiritual traditions at Mount Holyoke. A reception will follow immediately in the narthex. For any alumnae and guests staying at the Willits-Hallowell Center. Registration wallet must be turned in by 11:00 a.m. at the front desk. For alumnae and guests; tickets required. Limited tickets are available at the Willits-Hallowell Center for those who have not preregistered. Come meet the chaplains and advisors of the Office of Religious and Spiritual Life to hear all about our current programs and to share your memories. Friday, 8:30 a.m.–5:00 p.m.; Saturday 1:00–5:00 p.m.; Sunday closed. You’re history! Come visit Archives and Special Collections to share stories about your Mount Holyoke experience, learn about the history of College traditions, and make class buttons featuring your class colors and mascots. This is also a great time to donate material to the Archives! The cutting edge and the traditional thrive at the Mount Holyoke College Art Museum. The museum specializes in innovative approaches to teaching with art from across the globe and throughout time. Founded in the centennial year of 1876 with a handful of global artifacts and one Albert Bierstadt painting, the museum has grown steadily and now holds over 17,000 works of art, decorative art, and material and visual culture, and continues to expand its holdings with new acquisitions. We look forward to welcoming you to the galleries to see our special exhibitions and highlights from the permanent collection! Friday, 7:00–9:00 a.m., Noon–2:30 p.m.
Saturday, 7:00–9:00 a.m., Noon–2:30 p.m.
Sunday, 7:00–9:00 a.m., Noon–2:30 p.m. Receive a ten percent discount when you show your Alumnae OneCard. Friday, 9:00 a.m.–4:00 p.m.; Saturday, 9:00 a.m.–4:00 p.m.; Sunday, 9:00 a.m.–4:00 p.m.
Friday, 9:00 a.m.–5:00 p.m.; Saturday, 9:00 a.m.–5:00 p.m.; Sunday, 9:00 a.m.–1:00 p.m.
Open for self-guided touring Thursday–Sunday, 8:30 a.m.–4:30 p.m. Pick up a printed self-guided tour brochure in our lobby. Saturday 11:00 a.m.–5:00 p.m. and Sunday, 2:00–5:00 p.m.
Building Hours: Friday, 7:30 a.m.–5:30 p.m.; Saturday, 7:30 a.m.–5:30 p.m.; Sunday 7:30 a.m.–2:00 p.m. Fitness Center Hours: Friday, 7:30 a.m.–5:30 p.m.; Saturday, 7:30 a.m.–5:30 p.m.; Sunday 7:30 a.m.–2:00 p.m.
Children under age sixteen must be accompanied by an adult; children are not permitted in the fitness center, weight room, or field house cardio areas. The Career Development Center’s pre-law advisor, Roshonda Degraffenreid FP’10, will be available to offer advice on Friday, May 26 from 1:00 to 3:00 p.m. for alumnae considering applying to law school or pursuing a career in law. Please email Roshonda at degra20r@mtholyoke.edu to make a half-hour appointment. Appointments must be made in advance. Friday, 8:30 a.m.–5:00 p.m.; Saturday 9:00 a.m.–5:00 p.m.; Sunday closed. The recovery retreat room offers a quiet and safe space for those in recovery from alcohol or other drug abuse, or for those affected by another person’s use. There are pamphlets for the taking, books that may be used during the weekend, and local twelve-step meeting lists. Alcoholics Anonymous Meeting on Friday from 9:00–10:00 p.m.
Recovery Gratitude Meeting on Saturday from 4:30–5:30 p.m.
MHC’s answer to the local coffeehouse. Receive a 10 percent discount when you show your Alumnae OneCard.